"A delicious and refreshing dessert. Can also be made with mandarin oranges." Beat the eggs until frothy. Combine eggs, sugar, orange juice, and rind in a saucepan. Cook over low heat, stirring constantly, until very thick. Remove from heat, and stir in butter. Chill completely. Whip the cream to soft peaks. Fold into chilled orange mixture. Arrange a layer of orange sections in chilled vanilla wafer crust. 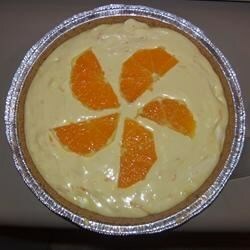 Spoon chilled orange mixture into crust, and top with additional orange sections. Chill until ready to serve.